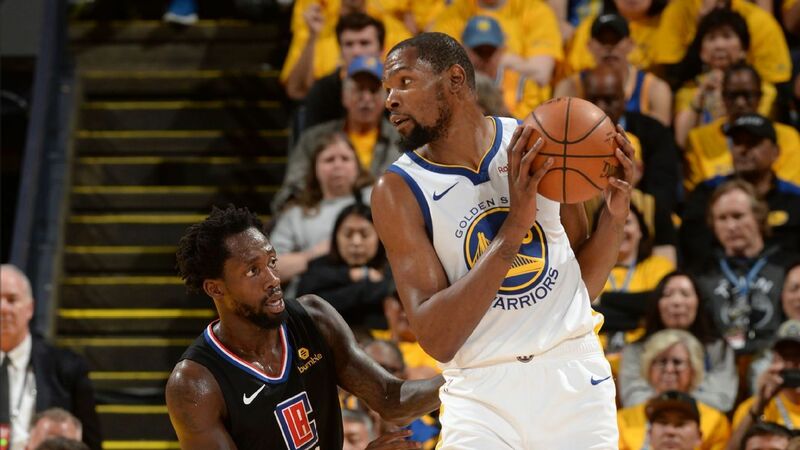 OAKLAND, Calif. — Golden State Warriors forward Kevin Durant and LA Clippers guard Patrick Beverley were ejected in the fourth quarter of the Warriors’ 121-104 Game 1 win in Saturday night’s Western Conference quarterfinal after receiving two pairs of double technicals for repeatedly jawing at each other. The initial set of double technicals came with five minutes left in regulation and the Warriors firmly in control. Durant and Beverley, who exchanged words throughout the game, were each given a technical as the officials tried to make sure the situation between the two didn’t escalate. Beverley, who has made a career out of getting underneath his opponents’ skin, mocked Durant’s body movements earlier in the game after being called for a foul on him. At that point, Durant laughed off the exchange. But tempers soon flared again later in the fourth when Beverley had the ball and Durant tried to strip him. With 4:41 remaining, Durant and Beverley got tangled up after Durant’s strip and exchanged more words. Referee Ed Malloy quickly ejected both players as a smiled crossed Durant’s face. A sold out Oracle Arena chanted “Warrrrriors!” as Durant and Beverley went to their respective locker rooms.